Do you think you have to spend countless hours every week logging up the kilometres, or follow exhaustive training programs to improve your running? Well, you don’t, and all of the above is achievable no matter what age you are, or what your ability is! In fact, if you are running no more than 20kms/week, you can get better without running any more….. and research has proven this!! Imagine your confidence growing as your skill and strength improve, and you’re able to extend yourself without the fear of injury. Firstly, let me introduce myself. My name is Graham Nelson and I am a qualified Physiotherapist with a Masters degree in Musculoskeletal Physiotherapy. I have been practising for over 18 years, and have treated many runners from the recreational to the sub-elite level. 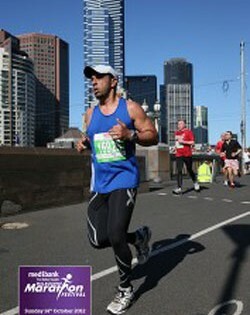 Check out my Physiotherapy clinic at http://www.nwpg.com.au for more info. I am also a very keen runner, have completed 2 marathons to date, countless half marathons and 10km races, and run between 30-50km/week depending on my training cycle. As a Physiotherapist, you could say that I have a reasonable knowledge of the human body and how it works, especially how it moves… ie biomechanics. I have also spent a lot of my spare time researching scientific literature on running performance and strength training, and you may be surprised at what I’ve found. This information is not new, but many coaches and athletes are either not aware of it, or do not place enough emphasis on it.